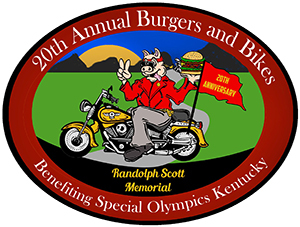 Burgers and Bikes will celebrate its 20th Anniversary on Sunday, Sept. 16, and for the second year in a row, the event will benefit Special Olympics Kentucky. Burgers and Bikes is an event for people who love motorcycles, good food, good music and fun. The event will include a bike show and a police motorcycle demonstration from the Lexington Police Department, live music from A Commonwealth Band and food offerings from Red State Bar-B-Q, Mad Mike’s Food Truck, Nothing Bundt Cakes and more. There will also be a silent auction, 50-50 raffle and motorcycle themed vendors. Burgers and Bikes has benefited Special Olympics Kentucky for two years, but our association with Man O’War Harley-Davidson and the motorcycle community goes back much farther than that. Man O’War Harley was one of the founding sponsors of the Guy’s Ride to Win (later Ride to Win) events that we put on for many years. They also supported the annual Special Olympics Kentucky Harley Raffle. Burgers and Bikes was founded by longtime Lexington Harley Owners Group (HOG) Chapter president Randolph Scott. Randolph was also a big supporter of the Ride to Win and Harley Raffle. The event continues in his memory after he was killed in a motorcycle accident in 2014. We are thrilled to once again be involved with an event that bears his name. For more information about Burgers and Bikes or for information about sponsorship opportunities, contact Trish Mazzoni at tmazzoni@soky.org or 502-695-8222.